A 103-year-old judge’s long service on the federal bench has become a testament to one man’s sheer determination and to the inner workings of the court system. U.S. District Judge Wesley Brown was appointed by President Kennedy in 1962. 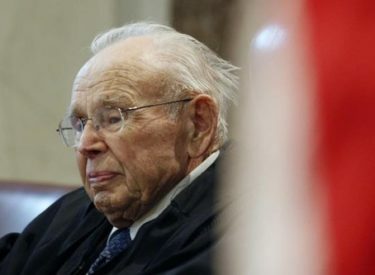 He is now the oldest federal judge still hearing cases. Brown arrives at the courthouse at 8:30 every workday to handle civil suits. He needs a wheelchair and an oxygen tank, but can still hear testimony and issue rulings. Brown is one of more than 500 judges on so-called senior status who keep working after retirement age. Their service helps keep the system functioning at a time when litigation is increasing. Brown says his judgeship was a lifetime appointment, and that’s how long he intends to keep it.